There is currently a bug that causes modded cursors to turn black and white when running the game in DirectX 11. This is a replacement for the vanilla cursor in Banished. The original one was just the default Windows cursor, meaning this fixes a simple but core feature of the game. Running the game with DirectX 9 won't affect gameplay in the slightest but you may notice some small visual differences. With standard install: download the 1.0.4 patch (official site) and extract it into your game folder (making sure to preserve the directory structure of the archive). Click the mods button on the main menu, and select which mods you want to be active. Any new games you start will have those mods enabled. UPDATE: The new Beta 1.04 Build: 141003 claims to fix the DirectX bug by introducing a Software Mouse option in the Input settings. Enabling this doesn't seem to work properly as it will create 2 cursors on your screen instead. Rebuilding my mod with the new patch/modkit has the same results. Thanks Blinkin for informing me of this information. Feel free to leave any feedback, bug reports, and constructive criticism in the comments. 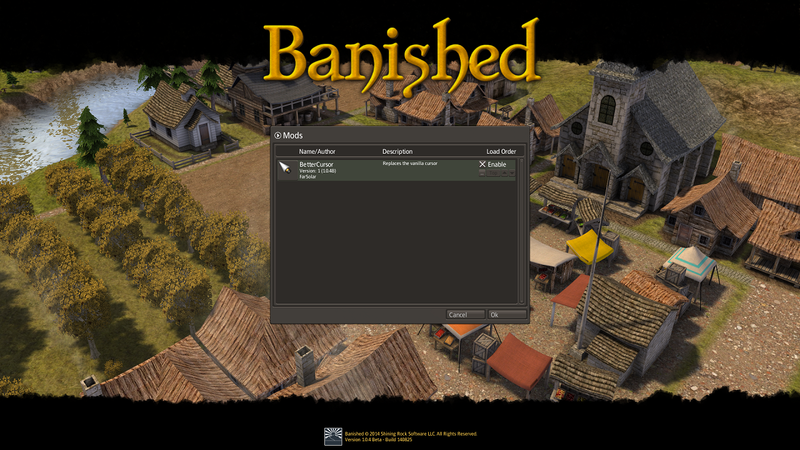 Also available on the Nexus: http://www.nexusmods.com/banished/mods/11/?